The first- and second-stage launchers of the Long March 2F rocket, which will carry China's crewed Shenzhou 10 spacecraft, are placed at the Jiuquan Satellite Launch Center for further testing in Jiuquan, northwest Gansu province. The Long March 2F rocket, delivered to the center on May 2, is technologically advanced and more reliable compared to the one that carried the Shenzhou 9. 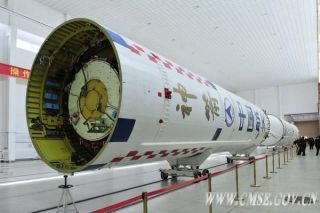 Slated for blastoff, perhaps in early June, Shenzhou 10 was delivered to the launch center on March 31. China is readying its next piloted space mission with a three-person crew set to rendezvous and dock with the nation's Tiangong 1 space module now in Earth orbit. The Shenzhou 10 spacecraft could blast off as early as June 7, although the launch window appears to stretch into August. The Long March 2F rocket that's designated to boost Shenzhou 10 into orbit was delivered by train to the Jiuquan Satellite Launch Center in Gansu province in early May. The Shenzhou 10 spacecraft has completed testing and is also at the launch center. According to Bao Weimin, a technological division chief with China Aerospace Science and Technology Corp., which manufactured the spacecraft, the soon-to-fly mission will engage in research to help in construction of a larger space station. Few details regarding other mission objectives have been fully discussed, but the mission will, for the first time, see Shenzhou 10 crewmembers deliver science lectures to young people from orbit. Zhang Bainan, chief designer of the Shenzhou 10, said its key task will be to find and tackle problems using Tiangong 1 that may occur during the construction of the heftier space station in 2020. Staff members hoist the first-stage launcher of the Long March 2F rocket, which will carry China's new piloted spacecraft Shenzhou 10, at Jiuquan Satellite Launch Center. The 8.5-ton Tiangong 1, or Heavenly Palace 1, has been circling Earth since September 2011. It latched up with the unpiloted Shenzhou 8 spacecraft in November 2011 and was used in China's first piloted rendezvous-and-docking venture — the three-person Shenzhou 9 space trek — in June 2012. As a target module for Shenzhou 10, the Tiangong 1 is reportedly in good condition. China Manned Space Engineering program officials have pointed out that the Long March 2F rocket has undergone more than 10 technological innovations to improve its safety and reliability since the boosting of Shenzhou 9. It will be the heaviest rocket China has ever launched. Shenzhou 10 will be China's fifth crewed flight mission and some reports note that the three-person crew includes a woman — perhaps Wang Yaping — among the team spending 12 days onboard Tiangong 1. According to Chinese news sources, space-tracking ships — Yuanwang III Yuanwang V and Yuanwang VI — have set sail to support the upcoming mission. The state-run Xinhua news agency quoted Chinese space specialists earlier this year as saying the larger space facility will use an array of cutting-edge technologies in flight control, power supply and waste recycling. For example, power generation from solar panels will be made more efficient and the life span, reliability and safety of energy storage batteries will also be enhanced. Zhou Jianping, designer-in-chief of China's manned space program, told Xinhua that the 2020 station consists of three capsules, including a core module and two laboratory units. It is capable of docking one freight spacecraft and two manned spacecraft, and the entire system will weigh more than 90 tons. This space complex can accommodate three Chinese astronauts who will work in half-year shifts during its operational period, but new capsules can be added as needed for scientific research, Zhou said. "This Shenzhou 10 mission will be the apparent end of the Shenzhou portion of China's manned space program … not an end to Chinese manned space, more like the transition from Mercury to Gemini, or Gemini to Apollo, without the fore-ordained goals of Apollo," said Dean Cheng, a research fellow on Chinese political and security affairs at the Heritage Foundation in Washington, D.C.
Cheng said the forthcoming mission will also likely test a more extended stay on the Tiangong spacecraft, with lessons from this and Shenzhou 9 presumably being used to tweak the Tiangong 2 spacecraft design. What will be interesting to see, Cheng said, is whether there will be any new types of missions set post-Shenzhou and before the space station that's scheduled officially for 2020. "That's seven years for the Chinese to do something else," Cheng told SPACE.com. "During this time, I'd expect to see Tiangong 2's design finalized and launched. Will it simply be an improved Tiangong 1? Might it be two Tiangongs docked together?" Recent test of Shenzhou capsule recovery in the event of a water landing. In the meantime, as a retrospective, Cheng said China's human spaceflight growth has been pretty impressive. "In 2003, China had only just launched its first person into space," he said. "Over the intervening 10 years, with no major hiccups, they have put up two people, then three, did a couple of spacewalks, and learned to dock spacecraft manually and automatically/remotely. This, with no pressure from a space race, but instead a methodical approach, step-by-step. "Consequently, while the Soviets gave up on the moon after 1969 — and arguably before — and the United States gave up after 1973 or so, the Chinese, I suspect, will set their sights on goals between here and the moon and probably beyond, and not then lose interest," Cheng said. "However, given their economic and demographic situations, otherfactors may eventually curtail their capacities," he said.